When we first meet FBI Hostage Rescue Team Leader Will Sawyer (Johnson), he is leading his group in trying to arrange the surrender of a man who is also holding his young son. Thinking he has resolved the situation, Will and his team are badly injured when the man, feigning surrender, detonates a bomb. Waking up in the hospital, he is comforted by the reassuring face and words of trauma nurse Sarah (Campbell). Jump ahead several years. Will and Sarah are now married, with two young children. They are in Hong Kong where Will, now a safety and security assessor, has been summoned to go over the world’s tallest building. Without his O.K., the buildings lavish owner cannot get the 200-plus story building insured. Things go well until Will is attacked by a mysterious person trying to get a computer tablet he possesses that gives him access to ALL of the building’s security protocols. It seems someone doesn’t want the building to open. EVER! 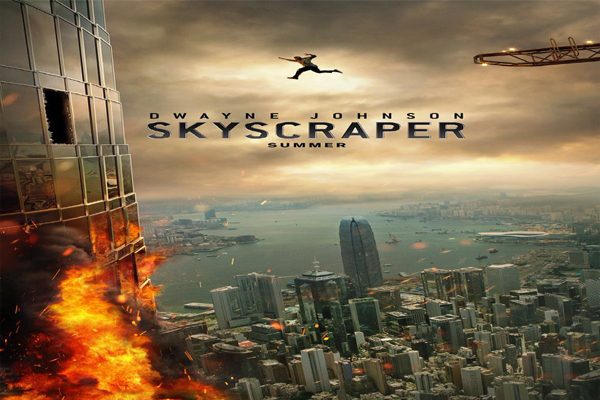 Full of some amazing set-pieces and some serious “jump in your seat” moments, “Skyscraper” is a film that rides capably on the back of Dwayne Johnson. Will possesses both Willis’ John McClain’s personality while also embodying the caring about of the situation that Newman’s architect and McQueen’s fire chief did in “The Towering Inferno.” But while the latter film’s destruction was due to an accident, “Skyscraper” deals with a nasty man by the name of Kores Botha (Moller). He’s not as smooth as Alan Rickman’s Hans Gruber, but he is as vicious. The cast does a fine job in dealing with the situations around them, and I’m giving Johnson extra credit because, due to opening bomb explosion, Will is missing a leg, having to move about the building (and do some extraordinary stunt work) on a prosthetic leg. And yes, while I realize it’s all CGI, Johnson moves and reacts as if he really is standing precariously on a piece of molded metal. 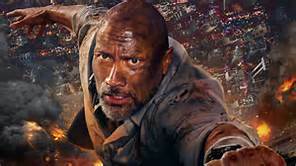 The story moves smoothly and represents a graduation to a new genre’ for writer/director Thurber, best known for creating the “Terry Tate, Linebacker” series of commercials as well as the film “Dodgeball: A True Underdog Story.” The film moves on and the action flows. A definite hit for the hot days of July.